Here’s a light and easy chicken dish that takes about 30 minutes from start to finish. Place chicken in lightly greased 13×9 baking dish. Mix mayo and mustard, spread on top of chicken. Sprinkle with nuts & press in slightly. 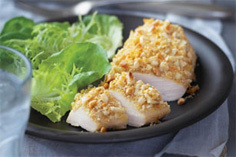 This entry was posted in Chicken, Main Courses / Dinner, Recipes and tagged almonds, chicken, dijon, dinner, recipes. Bookmark the permalink.